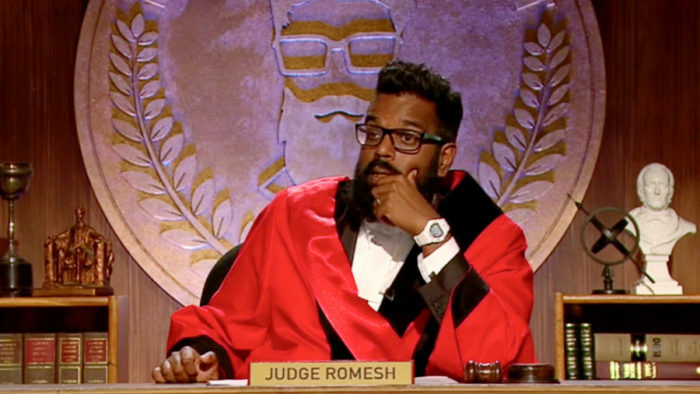 “I’m a judge, mate.” In today’s society, that’s all it takes to become a judge, as Romesh Ranganathan swoops into a courtroom on Dave this week, complete with wig, robes and gavel. But after seeing Judge Romesh in action, you may well wish all justice were carried out this way – either a sign of just how bad Brexit Britain really has become, or proof of how funny Romesh is. 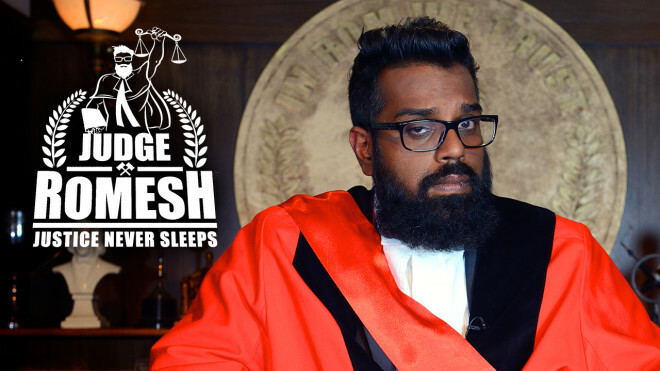 Judge Romesh is essentially a spoof on the kind of fake court reality series that have plagued US TV ever since Judge Judy’s heyday. While those were laughable enough in themselves, Dave’s legal comedy does away with any pretence of actual due process: Romesh body pops, swears at people and high-fives everyone in his courtroom when he enters. In short, he does everything except actually judge cases. After all, why bother with the law when you can help people by making sarcastic remarks? Romesh is supported by Tom Davis (Murder in Successville) as the court’s bailiff and Kerry Howard (Witless) as the clerk, both of whom also do nothing vaguely resembling their professional roles. They pop up repeatedly with giggle-inducing lines, as Howard stirs up the tension between Davis and Ranganathan, and Davis steals scenes by interacting with each plaintiff and defendant with an intimidating deadpan. The guests themselves are an admirably mixed bunch, from Hannah and Sean, a wife who is tired of her husband buying things to horde in his man cave, to Charles and Wez, a vacationer who found that the holiday the other booked him was actually just a course on chatting up women. 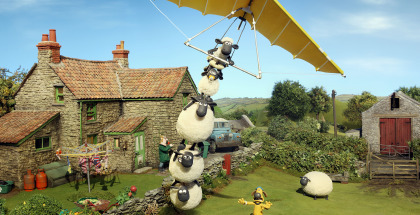 Children’s entertainers, musical disputes and more are on the cards, alongside the occasional D-list celebrity. But the truth is that it doesn’t matter who’s on the stand: Judge Romesh is the star of the show and it’s a perfect showcase for the comic’s talents. As he proved with both BBC Three’s Asian Provocateur and BBC Two’s Misadventures of Romesh Ranganathan, he’s a naturally funny presence, and his ability to be bluntly sarcastic without annoying anyone is a perfect combination of bitter British cynicism and winning charm. Rather than pack all this into hour-long chunks, Dave is smartly broadcasting what are essentially short skits in 30-minute bursts, two cases per episode. Before that starts, whet your appetite with some bonus exclusive cases on UKTV Play through your on-demand platform, under the title Justice Never Sleeps. With each one under 10 minutes, they’re perfectly sized for quick on-the-go streaming. Judge Romesh premieres at 10pm on Dave on Wednesday 8th August. From the amusing farce of a faux courtroom to the nail-biting truth of a crime that’s all real. 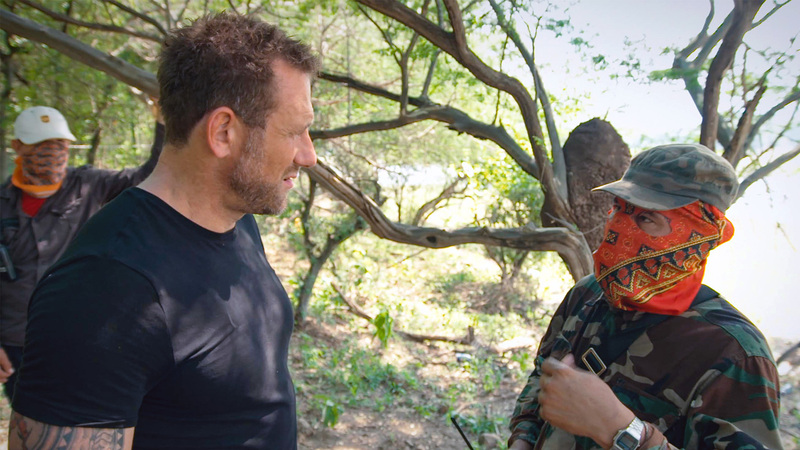 Netflix’s Narcos almost pales in comparison to this Channel 4 documentary, which places former SAS trooper Jason Fox right in the middle of Latin America’s drug trade. The documentary sees Fox start off with the Sinaloa cartel in Mexico, who make over $30 billion a year. “You came at a bad time,” jokes one of his hosts, and that soon becomes swiftly apparent, as guns are fired, bodies fall to the ground and meetings are awaited in nervous anticipation. That all this is happening on the other side of the world should come as no surprise, but this is a gripping reminder that a trade we so often see in glamorous fiction remains brutally real. 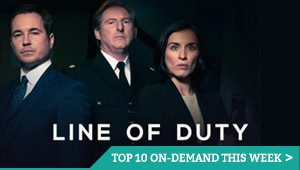 If you make it through the first episode, another two heart-stopping hours await. Every now and then, a TV show comes along that is so dumb and so downright weird that’s impossible to put into words. Evil Monkeys is one of them. ITV 2’s comedy gameshow sees a group of contestants land on Monkey Island, a mythical island in Japan where evil monkeys toy with them across a series of sensory deprivation games. No, this isn’t a joke. The show features TOWIE veterans (if you were wondering what level of celebrity to expect) who end up having to communicate and guess letters, words and phrases (without seeing, hearing or speaking) – something they do with confusion, frustration and, eventually, elation. But just in case you might confuse this with a poor man’s The Crystal Maze, the show intercuts each of these bizarre trials with cutaways to monkeys apparently watching the show, operating levers and laughing at their captors. It’s surreal, it’s disturbing and it’s relentless, somehow combining extreme satire of precisely these kind of idiotic TV shows with a particularly sadistic form of slapstick (one of the challenges gives the contestants electric shocks for being wrong). It’s stranger than seeing a press conference with Donald Trump, more compulsive than witnessing Love Island in action, and scarier than interviews with the UK government about how Brexit is going. Or, in other words, it’s the most 2018 thing to happen to TV this year so far. It just might be brilliant.